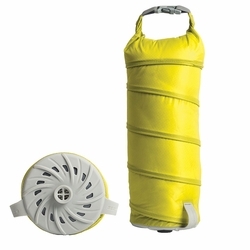 Sea to Summit Jet Stream Pump Sack. The Jet Stream is Sea to Summit's efficient sleeping mattress pump, which doubles as a stuff sack. The pump works on a concertina action. Multiple one-way air intake ports inflate the pump quickly on the upstroke. On the down stroke, this air is expelled into the mattress through the center valve plug. Each stroke delivers more than a lung-full of air, without making the user dizzy or adding moisture into the mat. The Jet Stream stores small and flat, or can be used as a stuff sack for your sleeping mattress or other gear. Sea to Summit sleeping mats that will fit inside the Jet Stream pump include: Ultralight S,M,L | Ultralight Insulated S,M |Comfort Light S,M,L | Comfort Plus Tapered S,M,L | Comfort Plus Rectangular M,L | All other Sea to Summit mats will not fit.